Located just 10 miles northeast of downtown Los Angeles, Pasadena was first inhabited by the Hahanog-na Indian tribe, who lived in villages scattered along the Arroyo Seco and the canyons from the mountains down to the South Pasadena area. But, like the rest of California, the Spanish moved in the late 1700’s and in 1771 established the San Gabriel Mission and began to convert the Indians to Christianity. The mission was prosperous, surrounded by orchards, vineyards and livestock. When the land passed from Spain to Mexico in 1833, the vast lands of California were granted to Mexican citizens and divided into ranchos. The area that would later become Pasadena was named the Rancho del Rincon de San Pascual. The last owner of the 14,000 acre land grant was Manuel Garfias who was allowed to keep the property after California became a state in 1850. However, over the next two decades, portions of the Rancho were sold off to new white settlers. In 1873, Dr. John S. Griffin and Benjamin Wilson owned more than 5,000 acres of the original land grant. Wilson, who would later become the first Anglo major of Los Angeles, agreed to sell some 4,000 acres to Dr. Daniel M. Berry of Indiana in 1873. To raise funds to bring a group from Indiana who were seeking fairer weather following an exceptionally bad winter, Berry formed the Southern California Orange and Citrus Growers Association and sold stock. On January 31, 1874, Berry and the Indiana newcomers incorporated the “Indiana Colony.” The colony was named “pa-sa-de-na” meaning “of the valley” to the Chippewa Indians. In 1886, the settlement became the second incorporated city in Southern California. Before long the city was growing quickly and became an important stop on the Atchison, Topeka and Santa Fe Railway, bringing even more people to the city and creating a real estate boom that would last from the 1880’s until the Great Depression. 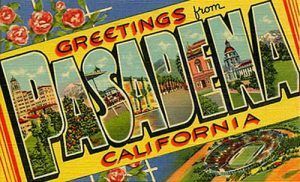 Pasadena became a winter resort for wealthy Easterners and a number of grand hotels were built in the late 1800’s and early 1900’s. Of these, two buildings continue to survive today, including the Hotel Green, built in 1888, and the Vista Del Arroyo, built in 1903. The Hotel Green, once the social center of Pasadena, is now called the Castle Green and serves as both individual housing units, and a location to be rented for parties and events. The Vista Del Arroyo, now houses the Ninth Circuit Court of Appeals. At the turn of the century, Pasadena boasted a little more than 9,000 residents, but just a decade later had grown to over 30,000. This period also saw a number of craftsman style homes built in Pasadena, many of which still stand. The most notable is the Gamble House, built in 1908 by David and Mary Gamble of Procter & Gamble fame. Today, The Gamble House operates as a museum. In 1913, the beautiful 150 foot high Colorado Street Bridge was constructed across the dry Arroyo Seco, spanning nearly 1,500 feet across the riverbed. Though notable for its distinctive arches and railings, it also became notorious for something else – suicides. 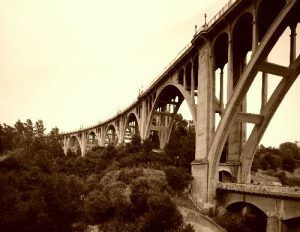 Before, long, it had gained the nickname of “Suicide Bridge” after dozens of people had tumbled to their deaths. Later a suicide barrier was added that reduced the number of ghastly jumpers, but the bridge has always retained the nickname. Not surprisingly, another legend surrounds the bridge – the ghostly tales of those who died there. But that’s another story — see HERE! 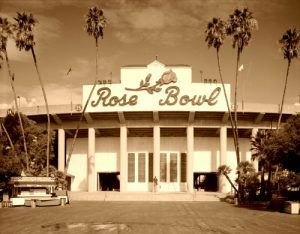 The 1920’s continued to be profitable for Pasadena as it hosted tourists as a winter resort and began to grow culturally, adding the Pasadena Playhouse in 1917, the Rose Bowl Stadium in 1922, the Grace Nicholson Gallery in 1926, which is now the Pacific Asia Museum, and a number of other local attractions. It was during this time that Route 66 was commissioned, coming straight through the heart of Pasadena and bringing even more people to the city. However, the boom was short-lived as the Depression signaled the end of an era for Pasadena, disrupting its tourist economy which never resumed at its previous level. During World War II, Pasadena became a base for much of the military traffic, turning many of the hotels into military command headquarters and lodging for soldiers. The Vista del Arroyo Hotel was purchased by the Army and became a convalescent hospital for the wounded. In the meantime, the city was turning to a more industrial focus. In December, 1940, the Arroyo Seco Parkway was completed, which became the new alignment of Route 66 from Pasadena to Los Angeles and the first “freeway” in the United States. Providing a faster and more direct route from Pasadena to Los Angeles, the city began to boom again, especially after World War II was over. By 1950 the population had increased to more than 100,000 and the city that was once known for its attraction to tourists, was inundated with smog from its high industrial areas. The heart of the city became dilapidated and major companies began to leave. However, over the next several decades, Pasadena recovered with the help of redevelopment and preservation groups. Historic homes and buildings began to be renovated and restored, most especially in Old Pasadena, where the city’s business district first started. Today, the city provides a number of historical and architectural gems, with Old Pasadena being the focus of revitalization and now serving as a dining, shopping, and entertainment mecca. As the Route 66 traveler enters Pasadena a number of vintage motels and restaurants can be seen among the modern buildings. Be sure to check out the Astro Motel at 2818 East Colorado Boulevard in East Pasadena. Further along, you’ll come to Old Town, where a number of 1920’s and 30’s buildings stand alongside more contemporary businesses such as the Rose City Diner, which provides an atmosphere of times long past. For another choice eating spot try Jake’s, which has been pleasing Route 66 travelers since 1947. Here, shoppers will also find numerous antique stores, boutiques and souvenirs. Other opportunities in Pasadena include the Pacific Asia Museum just off Route 66 on North Los Robles Avenue and south of Colorado on Orange Grove is the Tournament House and Wrigley Gardens originally built by William Wrigley of chewing gum fame in 1914 and now home to the Tournament of Roses Association. A drive north on Orange Grove leads to the Gamble House, a large Arts and Crafts era home built in 1908 by David and Mary Gamble of Proctor and Gamble fame. South of Colorado Boulevard at 39 South El Molino Avenue is the Pasadena Playhouse which has been entertaining Pasadena audiences for 80 years. In neighboring San Marino is the Botanical Gardens and the Huntington Library, Art Collections. There are three alignments from Pasadena to Los Angeles. The original 1926 route follows Colorado Boulevard to Fair Oaks Avenue to Huntington Drive, to Mission Road to Broadway and downtown Los Angeles. This Route takes you through South Pasadena, a city that continues to remind people of small town Americana, with its quaint stores and small town personality. There are several interesting stops here including the historic Mission West district, on Mission Street just east of Orange Grove Boulevard, that continues to reflect the same charm and character it did in the early 1920’s and 1930’s. The South Pasadena Museum, at 913 Meridian Avenue, occupies the original Meridian Iron Works building, one of the oldest structures still standing in the city. The museum features numerous artifacts tracing the history of the San Gabriel Valley. Across the street is the Century House, one of Pasadena’s oldest residences and often utilized in motion pictures including two of the Halloween horror movies. An absolute “must stop” in South Pasadena is the Fair Oaks Pharmacy and Soda Fountain at the corner of Mission Street and Fair Oaks Avenue. This vintage relic has been fully restored and has been serving Route 66 customers since 1915. Also, at 1023 Fair Oaks Avenue, is the historic Rialto Theatre. Sadly, after 81 years of entertaining customers, the old movie house closed its doors in August, 2007 and its future remains unknown. Another interesting tidbit is that this old theater is allegedly haunted. 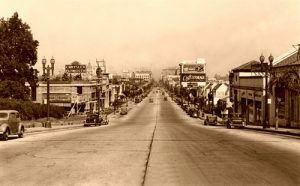 A second alignment, referred to as Alternate Route 66, began in 1938 and went westward on Colorado Boulevard (also called Colorado Street), crossing the famous Colorado Street Bridge before turning south on Figueroa Street and rejoining the original route. The Colorado Street Bridge spans the Arroyo Seco from Pasadena into Eagle Rock and actually predates Route 66, built in 1913. With its graceful arches spanning nearly 1500 feet across the riverbed, it is a work of art worth seeing. It also has a legend attached to it. Frequently called the Suicide Bridge, a number of people have leapt to their deaths on this old bridge, prompting numerous haunting tales. In 1964, this alignment of Route 66 was eliminated. This route will take you by the Norton Simon Museum just before crossing the Colorado Street Bridge. The third and final routing from Pasadena to Los Angeles was on the Arroyo Seco Parkway, presently the Pasadena Freeway (110) and now a National Scenic Byway. The Fair Oaks off-ramp leads directly into downtown South Pasadena. The parkway continues, providing beautiful views of the San Gabriel Mountains before winding through a chain of small parks and craftsman-era bungalows in the Highland Park neighborhood. There are several potential stops on your way to downtown Los Angeles including the Southwest Museum, the Lummis House, the Audobon Nature Center at Debs Park, Heritage Square, and the Los Angeles River Center and Gardens. As you near downtown other interesting side trips present themselves to Dodger Stadium, Union Station, Elysian Park, Chinatown, and the El Pueblo de Los Angeles Historic Monument. All images available for photographic prints and downloads HERE!